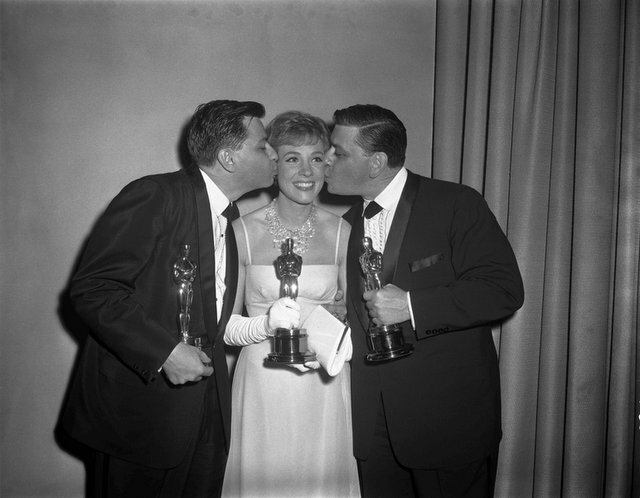 The Sherman Brothers. In the history of Disney, I would wager that the Sherman Brothers may be the most recognizable, the most loved, musical group of any in the history of Disney movies. So many of their great songs — especially for the Disney classic movie Mary Poppins — are seeing a revival as a result of the success of the movie Saving Mr. Banks. It has led to a re-appreciation of all that the Sherman Brothers meant to Walt Disney and the movies they wrote their music for. I would hazard a guess that the music, had it not been as memorable, as successful, as it was, would have meant all the difference between success and failure for the movie. Now, the music that the Sherman Brothers made famous is being re-performed, adapted for today’s audience, and being recorded and uploaded for a new generation of fans. Take, for example, this incredible video, pieced together by Jeffrey Sherman, son of the late Robert Sherman, that is my favorite song from Mary Poppins — Feed the Birds. In this case, it’s being performed by Kristen Chenoweth at the Hollywood Bowl. Please enjoy! These are just two examples of the wonder of music, and how it can reach deep inside your soul and bring out emotions that you had forgotten you had. I have really enjoyed seeing a revival of the music of the Sherman Brothers. It is a reawakening of the spirit of that great era of Disney when they were at their pinnacle, and the music brings me back to a simpler day and time, almost as if I were strolling down Main Street, U.S.A. itself! So, to all of you aspiring musicians out there, please, please, please, keep playing that great Sherman Brothers music! Hello my friends, and welcome to this week’s Prayer for the Week post! Today, as we close down our Christmas week, one of the biggest blessings I experienced this week was the ability to just relax. It is a shame that we all aren’t able to do that — my wife, for example, only had Christmas day off — and it is equally a shame that we don’t all choose to relax when we are given the opportunity to do so. For me, though, relaxation is a true gift that I hope I never take for granted. We have some serious prayer requests, so let’s get right to them, shall we? Here’s an update from Deb:Oh thank you Mike! He’s had surgery to stop the internal bleeding so prayers for healing would be greatly appreciated. His heart is showing signs of needing another stint (sp) so healing there too. His spirits are great though and have been throughout. We could use some peace of mind! Thank you so much! Father God, we come to you to pray for your servant Deb and her husband. You know all of the health issues that he is going through, and we know that through You, all things are possible. Please lift up Your Servant so that he may feel the healing power of Your love, and please grant them all of the comfort and strength they need to get through this ordeal. Lord, aside from healing, perhaps the most important thing that we can grant to them is Your Peace to descend on them so they may feel Your presence in their lives. We ask for these things in the name of Your Son Jesus, who lovingly gave of Himself so that we might have Eternal life. It is in His name that we pray with Thanksgiving. Amen! My friend Melissa has a prayer request for her dog. Here is what she wrote on Facebook:Mike, my dog Liam is dying. And he’s me and husbands best friend. I would really appreciate your prayers. My friend Donna left this comment on Facebook.I’m not a Christian, but if you could aim your energy so that my 7 weeks of Unemployment checks that have been held up finally get released to me I would be grateful! Please pray for those that are saved and unsaved, so that they may know the true Peace of God in their lives. Thanks! My Dreams of Disney reader Becky wrote this comment about Christmas, and how so many people suffer during this time of year. Please remember them in your prayers also.I know so many this year who are struggling with severe health, financial, or relationship problems. Holiday time seems to make struggling with these issues even harder. We must continue to pray throughout each day that they will feel and see God’s presence, peace, joy, and love in their lives, and be blessed with strength. Thank you for your page that reflects this. My friend Catherine posted this on Facebook. Please pray for her Mom:Just to let those of you who know my mom she fell last night in our garage around 11pm & the garage was open & I didn’t find her until 630. She is at baptist health on warmers. Her internal temp was 89 degrees when she got here. Please say prayers that there are no long term effects. To all my friends who are faithful believers in the one true God, please join me in praying for this precious family. Beth and Chris are newlyweds. They have a sweet little boy and so much love for one another it warms your heart. They have just found out that Chris has Stage IV cancer. They are keeping the faith and keeping their attitudes positive but I know the power of prayer and that this is what they need more than anything else. Won’t you please join me in lifting up this sweet family? I sure would appreciate it and I know they will too! Thank you!! As you can see with these prayer requests, there is anything but relaxation going on for the families of these prayer requests. The biggest thing that I think we, as Christians, can pray for is for us to be able to let go of our problems and let God take over. When we do that, truly my friends, that is when it feels like the Peace of God pours down on us, and we really have a sense of calm about us. So, my friends, pray, of course, for healing, comfort, strength, and all of the other things that our prayer requests need; but, on top of all of that, pray earnestly for God’s Peace to descend upon those that are suffering, so that they may know that sense of calm that will see them through the trials and tribulations that they are going through. Merry Christmas to you and your family! Love the pocket watch.Just wanted to thank you for your prayers. Doctors finally got me back up and running with a round of antibiotics and a root canal. I also received my Disney Magic+ flash drive today. Not really sure what it is for as I already had My Disney Experience on my home page, but it sure looks cool. Vickie, thank you for your words, and we are glad that you are doing better! I found out that you can use the flash drive just like a normal flash drive, so use it with pride! It’s really cool to me to have a great flash drive like that! I hope you have a Happy New Year, Vickie! Thanks for stopping by! Thank you everyone for stopping by and contributing to our post — and most importantly, thank you for praying for our requests! Together, we can make a difference, simply by being the prayer warriors that God wants us to be. Have a great week, everyone, and we’ll talk to you later!